'Tis the season to moisturize! With a New Year right around the corner, it’s never too late to take charge of your skin. As you reflect on the past year and look forward to the next, commit to putting the health of your skin first. Skin stress that appears during the holidays can be the result of a lack of moisture, especially if you live in a colder climate. 2) Keep your showers short and sweet and use lukewarm water. Bathing for long periods in hot water can cause skin to lose natural oils and nutrients. 3) Winter can wreak havoc on your skin because there is less moisture in the air, low humidity. Give your skin a boost and run a humidifier at night to help add moisture.
. 5) 3 steps to revive dry feet. 1) Remove dry, flaky skin with a pumice stone. 2) Apply a rich moisturizer, like Eucerin’s Aquaphor Healing Ointment before bed. 3) Throw on a pair of socks to lock in the moisture and go to sleep! 9) Coarse fabrics can cause itchiness if you have sensitive skin. Go for something silky! 11) Tame chapped lips. For lip hydration, try applying a few drops of olive oil and honey or pick up Aquaphor Lip Repair + Protect SPF 30. Eucerin Professional Repair Extremely Dry Skin Lotion (6.8 fl. oz.) helps alleviate and repair extremely dry skin with a unique concentrated formula that features a groundbreaking technology that combines skin’s own natural moisturizers and Ceramide-3, a component of a healthy skin barrier, with Gluco-Glycerol, an innovative moisturizer—to improve the condition of skin and fight extreme dryness. The product is highly effective and has been granted the Good Housekeeping Seal. If it doesn’t work as claimed Good Housekeeping will replace or refund the purchase price. 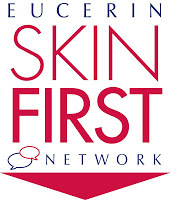 Make sure you check out Eucerin on Facebook to request a free sample! 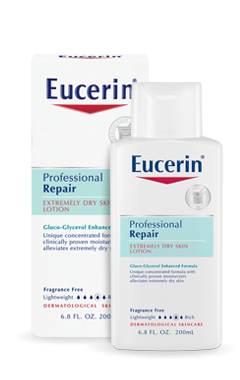 Right now, Eucerin is giving away an amazing package to one of my readers. One lucky winner will a, Prize pack that includes: Eucerin Smoothing Repair Dry Skin Lotion, Eucerin Professional Repair Extremely Dry Skin Lotion, moisturizing gloves, a pumice stone, and a $100 Visa Gift Card! To enter, fill out the Rafflecopter below: Good luck!!! !